Rather than just take me to my table, the maitre d' offered two options: "Do you want to go the regular way or the ninja way?" When you're dining at a place named Ninja New York, there's only one clear choice, and so began a descent into a subterranean 6,000-square-foot labyrinth that is the most absurd restaurant to open in years. 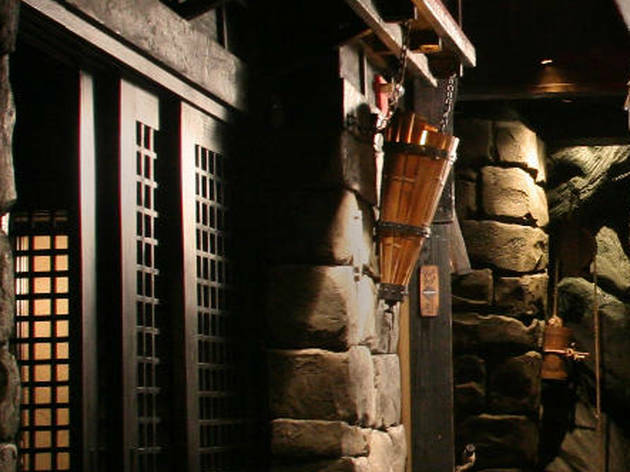 The ninja-warrior schtick starts with a walk over a magically lowered drawbridge that leads into what's supposed to be a Japanese mountain village but instead conjures medieval catacombs, with 22 private tables separated like crypts. The servers, who wear black robes, announce themselves loudly before entering, and begin some of the courses with "ninja magic" tricks that involve hokey glowing fingers and bursts of smoke and flame. The menus, unveiled on table-wide scrolls, claim to be based on a "secret ninja recipe bible." The food is best described as upscale fusion: mostly Japanese meets French. With a dizzying number of subcategories listed on the menu, it's easiest to submit to one of the ten-course tasting menus priced between $80 and $200 per person—a fine-dining experience filtered through a cartoonish gimmick. The ninja theme has proved to be a success before: Ninja New York is actually a spinoff of a similar restaurant in Tokyo, and 11 assistant chefs have been flown in for this $3.5 million launch. Ninja's top two chefs, both trained under "Iron Chefs" of Japanese television fame, prepare dishes like crème brûlée topped with steamed veal and foie gras, and foie gras terrine eaten with crackers shaped like throwing stars. Dish after dish scores points for style and creativity, but the food warrants only a shrug once consumed: The meteorite soup—a mixture of clam, bacon, pork, tom-yam-kung paste and soymilk—is cooked over some special 800-degree stone, yet tastes like a standard Thai offering. Chunks of grilled sea eel, steamed shrimp and vegetables come suspended together in an egg-shaped gelatin mold served in a "treasure box" full of smoking dry ice. Yes, you could play it safe and order from the large sushi selection. Some of the maki rolls are innovative; an elegant combination of shiitake mushrooms, shrimp tempura and purple rice are held together with soybean membrane. Unfortunately, sushi comes ninth in the ten-course tastings, by which time the theme has become intolerable. I began begging for the check just so that I could escape. Ultimately, the math at Ninja just doesn't add up: It's a theme restaurant in one of the least touristy neighborhoods with a menu full of items no pre-teen would ever eat, at prices no parent would ever spend—and no amount of ninja magic can fix that. Went here because we had a gift card, which I'm glad we did! The food is really not very good, and very expensive, the best thing on the menu is definitely the sushi because they don't have to cook it! Everything else seemed very poorly reheated! You're definitely paying for the "experience" which is really aimed at children. They mostly jump out from behind walls a couple of times, throw things at you and pretend to hit you with swords. We did get a ninja headband to take home, so that was something. Many of the entrees come with a Ninja presentation, that is usually "something is lit on fire" which was fun, I guess. A magician also came over to our table, he was pretty good and very nice although a bit shy. Overall its pretty cheesy and the food is bad, but the idea is interesting and the decor is impressive. Apps, entrees and cocktails were borderline inedible and were super expensive as well. We all finished barely half of our food and the waiters didn't even ask if we wanted to-go boxes, they know it's bad! Flavorless, super overpriced, total tourist trap. The only redeeming part was that there was a really skilled/entertaining magician that came our table. If you're going for the "ninja factor" like we did, don't bother. Barely anything happened while we were eating our meal-the waiter/actors are probably too afraid someone would choke or something. We also had trouble even finding the restaurant (the venue is a ninja too I guess, all invisible from the outside!) Skip it!